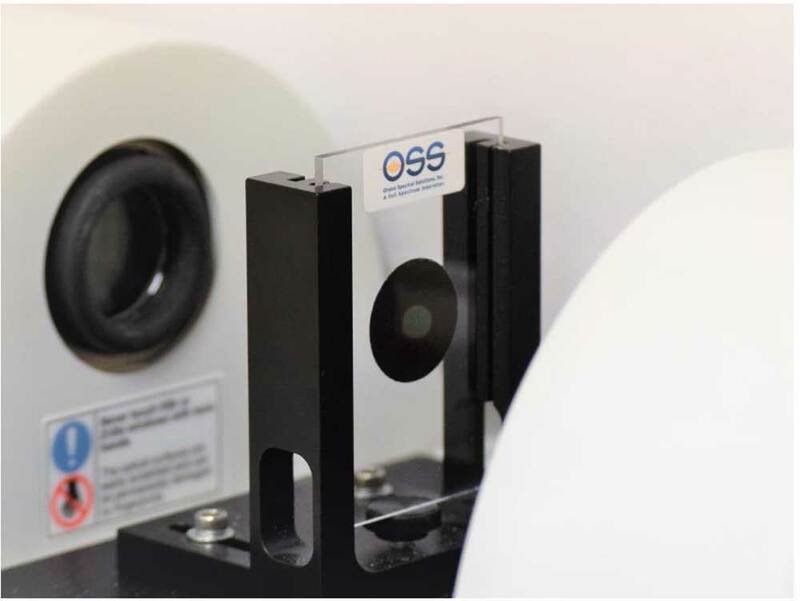 Frequently Asked Questions - Orono Spectral Solutions, Inc.
Q: How long does it take to perform the ASTM D7575 method, start to finish? A: Depending on the sample matrix, a sample bottle can be analyzed in 20 and 60 minutes. One of the key advantages of the ASTM D7575 method is multiple steps can be performed in parallel, resulting in an average processing rate of 3 to 7 sample bottles per hour. OSS can work with you and your specific system to minimize processing time and maximize efficiency. Q: How do I know if my sample is homogeneous? Q: My spiked samples have poor reproducibility. Why is this and how do I improve my results? A: Poor reproducibility is most likely due to drawing aliquots from a non-homogenous sample bottle. See the question above, “How do I know if my sample is homogenous?” and watch OSS’s tutorial video “ASTM D7575 Total Oil and Grease in Water Tutorial: Sample Preparation and Homogenization” for more instruction. Also, be sure to watch OSS’s tutorial video “ASTM D7575 Total Oil and Grease in Water Tutorial: HOW TO SPIKE IPR/MDL” for instructions to properly prepare spiked solutions and reduce the risk of poor reproducibility in your analysis of samples. Q: Can I spike samples by dropping oil directly into the sample? A: This approach will not work. Simply dropping pure oil into your sample bottle will not disperse the oil evenly throughout the sample. Watch OSS’s tutorial video “ASTM D7575 Total Oil and Grease in Water Tutorial: Spike Solution Preparation” for instructions to prepare the oil in acetone spike solution. Q: Can I use any oil of my choosing for the spiked samples? What is the appropriate material? A: The latest OSS SOP version for the ASTM D7575 method recommends using Heavy Mineral Oil (CAS #8042-47-5) to perform the spikes necessary for QA/QC purposes. Contact OSS at info@ossmaine.com if you wish to replace Heavy Mineral Oil with an oil more representative of the oil and grease found in your matrices. Q: Can I reuse a ClearShot™ Extractor? A: ClearShot™ Extractors are for single use only. Q: Do I need special syringes to collect and process samples? A: A Luer Lok tip syringe with low-extractable materials should be used for connection to ClearShot™ Extractors. Q: Can I reuse a syringe for sampling? A: A new syringe should be used for each aliquot removed from a sample to avoid contamination. Q: Can I use the OSS ClearShot™ Technology to measure the concentration of oil and grease in soil and sediment? A: Yes, OSS can work with you to find a solution. OSS has experience sampling sediment for oil and grease in the Gulf of Mexico after the 2010 Deepwater Horizon oil spill disaster as well as the Athabasca oil sands in Alberta, Canada. Please contact OSS for further guidance at info@ossmaine.com if you wish to analyze total oil and grease in sediment. Q: Can I use the OSS ClearShot™ Technology to measure the concentration of polar oils and grease as well as total oil and grease? A: The current ASTM D7575 method is validated to measure total oil and grease. However, the infrared properties of the ClearShot™ Technology could allow for analysis of polar oils in certain matrices. Please contact the OSS research team at info@ossmaine.com for more information. Q: How can I use OSS ClearShot™ Technology to identify the source of specific oils and greases in my process? A: ClearShot™ Technology’s inherent capability to measure the entire infrared spectrum can be used to identify the “fingerprint” of infrared absorption peaks specific to an oil or grease. We recommend that you contact OSS at info@ossmaine.com to discuss your particular needs. Q: Can I dry ClearShot™ Extractors in a drying oven? A: Yes, however ,it is not recommended due to the potential for flashing off volatile oil at drying temperatures. The ASTM D7575 method has been validated for numerous matrices using only pressurized clean and dry air for drying. Q: How do I install the OSS drying manifold? 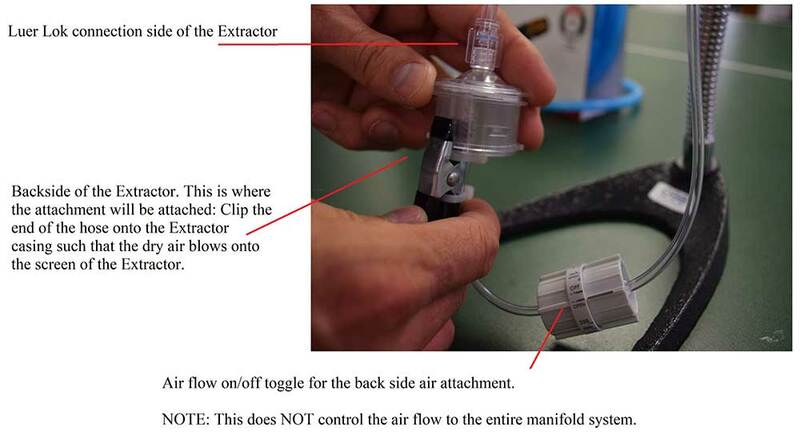 A: Please see the attached document “Dry Air Manifold Assembly” for instructions. Q: My sample is taking a long time to dry. How can I speed up drying times? A: Drying ClearShot™ Extractors should require 5 to 20 minutes. Samples that contain a large amount of particulate matter can “clog” the Extractor membrane. For situations in which there is little to no air flow, or no visible air bubbles being released on the metal screen backside of the Extractor, OSS recommends using the backside air drying attachment on the drying manifold to flow dry air on both sides of the extractor. See figure below. 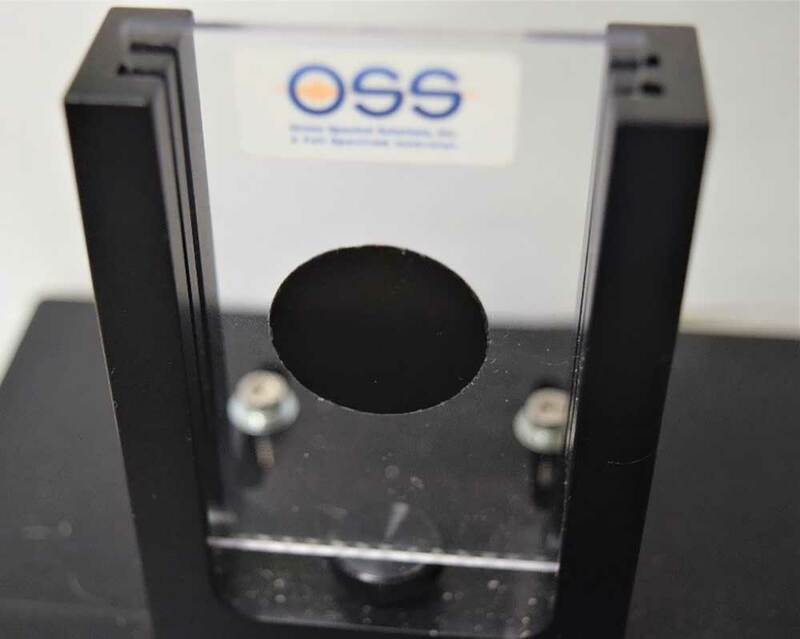 If you routinely process samples with high particulate content, contact OSS at info@ossmaine.com to customize your drying manifold setup to allow for speedy drying times. Q: How do I know the ClearShot™ Extractor is sufficiently dry? A: Analysis of total oil and grease is only possible after drying ClearShot™ Extractors with clean, dry air. If the membrane is translucent or if there is a broad peak present in the IR spectrum at 3400 cm-1, the extractor is not dry. 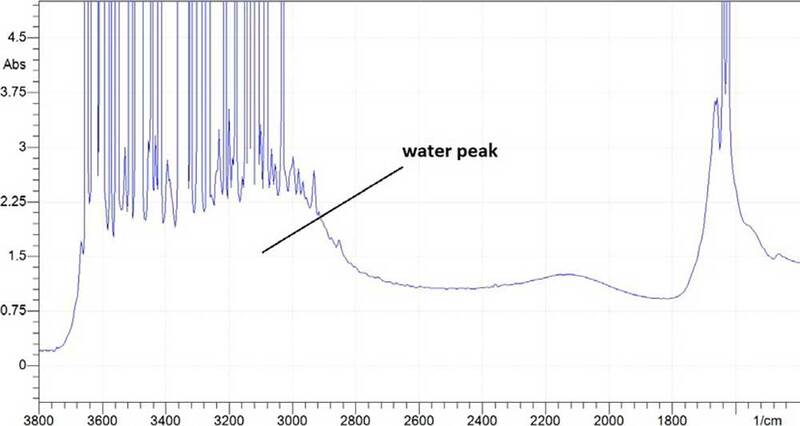 Figure 1 below shows the spectrum of a very wet membrane resulting in no hydrocarbon peak detected at 2920 cm-1. No analysis of oil concentration can be performed in this case. Additional drying is required. Figure 1.Spectrum of a very wet membrane. The broad water peak is masking the hydrocarbon peaks. More drying time is required. Figure 2 shows the spectrum obtained with additional drying time. In this case, the water band at 3400 cm-1 is about 2 absorbance units and the band due to the oil and grease at 2920 cm-1 is detected. 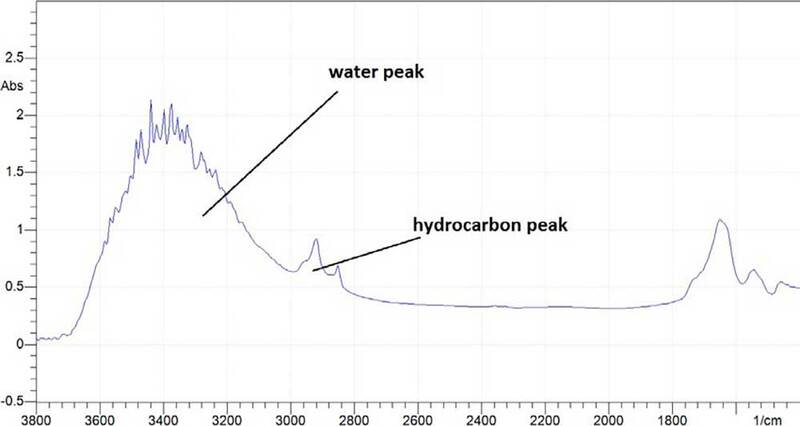 While the hydrocarbon peak is now visible, the water peak may still affect the baseline drawn from 2990 cm-1 to 2800 cm-1. At this time, the user may perform an analysis of total oil and grease, however, the Extractor should be dried further and subsequent analysis of total oil and grease performed to ensure the Extractor is sufficiently dry. Figure 2. Spectrum of an Extractor that has been dried further. 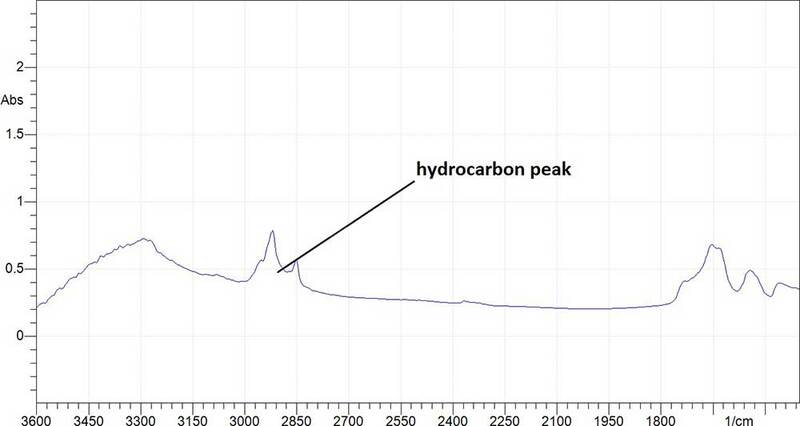 The hydrocarbon peak is now visible, yet the water peak is still prominent. Figure 3 below shows the spectrum of an Extractor that has been dried further. If the concentration of total oil and grease in Figure 3 is within 5% of the concentration determined in Figure 2, the membrane has been dried sufficiently. The water peak has no longer affected the measurement of the hydrocarbon peak. Figure 3. Spectrum of an Extractor that has been dried sufficiently. Iterative drying has shown that a sufficient amount of water has been removed. Q: Can I analyze samples with oil and grease concentrations greater than 200 mg/L? A: Yes, by performing volume corrections. While method calls for 10 mL of the sample to be processed through the ClearShot™ Extractor, less volume (as little as 2 mL) may be processed to analyze oil and grease concentrations above 200 mg/L. OSS can assist with the set up for your system’s needs. Q: Can I analyze samples with oil and grease concentrations less than 5 mg/L? A: Yes, by performing volume corrections or using a ClearShot™ Extractor with a smaller surface area. While the method calls for 10 mL to be processed through the ClearShot™ Extractor, more volume may be processed to analyze oil and grease concentrations below 5 mg/L. Similarly, a smaller membrane surface area will further concentrate the oil and grease. OSS can assist with the set up for your system’s needs. Q: How often should I use the 8 point Calibration Standard Devices? A: The 8 point CSD set is used when initially setting up the system and for each new user trained to run the method. Once the calibration curves are established, the full set of Standards should be used monthly. Q: How do I use the FTIR alignment card? Do I need to purchase it? A: The FTIR alignment card, when properly placed into the FTIR unit with the black disc facing beam source, should turn a lighter color in the middle of the card. This is where the beam will pass through the card and the sample. It is extremely important to ensure the cardholder is properly aligned in order to obtain accurate results. 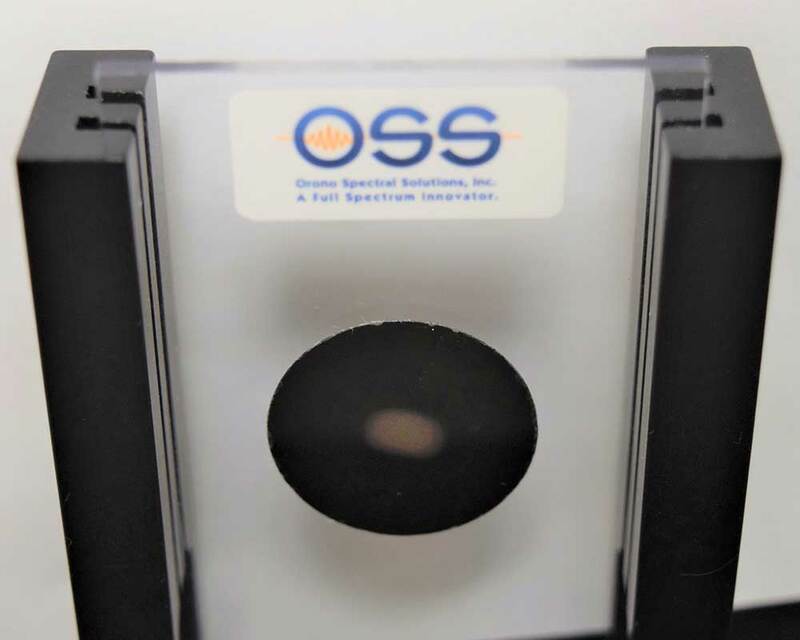 The OSS FTIR alignment card provides an easy visual aid to ensure proper alignment: If the light dot is not in the center of the circle, align the cardholder so it is. The picture below is of a properly adjusted alignment card and beam. Figure 1. Photosensitive cardholder changes color from dark to light, showing the FTIR beam path. Figure 2. When the card is first placed into the cardholder. It takes approximately 10 seconds of light exposure for the dark photosensitive circle to change color. Figure 3. LEFT: After approximately 10 seconds the black photosensitive material will begin to change color. See the light spot in the center of the circle. RIGHT: After about 20 seconds, the circle has expanded to its full diameter. The user can determine if the cardholder has been appropriately centered. Q: How should I store the ClearShotTM Extractors? A: Extractors should be stored in a low outgassing and non-volatile residue bag in a cool, dry, oil-free environment. Q: What is the shelf life of OSS ClearShot™ Extractors? A: Customers using ClearShot™ Extractors have not reported deviations for Extractors held in reasonable storage conditions for up to 2 years. If Extractors purchased from OSS have visible signs of degradation at any point in their shelf life, contact OSS and do not use these Extractors for testing.